To finish off a gruelling term of exams, the CURTC ladies took on the RTC Ladies in Cambridge on Saturday. Ellie McAleese debuted for Cambridge at 9:00am on the Green court against Alison Cryer of RTC (don’t worry… the wonderful new 2017/18 Ladies Captain, Olivia Chesser, was also at the courts at the start of that early May week hour). Unfortunately McAleese was unable to hold off Cryer, going down 8-5. Cambridge’s Linnea Gradin played Nick Hyams and engaged in a very tight tussle, going game for game. Unfortunately Gradin finally went down 8-6. Gradin and McAleese then teamed up for doubles, but the singles results were repeated and they lost 8-4 to the RTC pair. 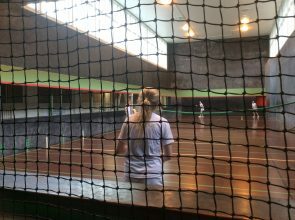 In sweltering heat, the afternoon session kicked off with a doubles match between Carina Mouritsen-Luxhoj and Lucy Barrett of CURTC vs Sarah Lambie and Alex Soltynski of RTC. The RTC team took no time to warm up winning 8-2. Mouritsen-Luxhoj then took on Soltnski on the Green court, while Barrett took on Lambie in the heat of the Blue Court. A lack of court time over the exam period showed for Barrett, losing 8-4 to a very tough opponent in Lambie. Unfortunately Mouritsen-Luxhoj shared the same fate, despite producing some incredible shots into the dedans and being a point away from a game on several occasions, she went down to Soltynski 8-0. We would like to thank the RTC team for making the journey to Cambridge and to Nicola Doble for all the organising that made it possible for this to happen (I hope we see you next time and maybe even reverse the results!) . Also thanks to Christie and the Pros for miraculously fitting us into a very tight schedule on Saturday.